The challenge of the Week of the Last Judgment is to take another look at our actions and how they affect those around us. The Week of the Last Judgment. It sounds a little disconcerting. No wonder Russians prefer to call it Maslenitsa! The name of the week is taken from the preceding Sunday, the Sunday of the Last Judgment, and the lesson of the day isn’t necessarily a frightening one at all. The idea is that at the Last Judgment, believers will be judged according to their actions, not just their faith. In the scripture reading of the day, taken from the Gospel of Matthew, Jesus tells his followers that they will be judged by how they have treated others – how they have acted when asked by those in need for food, clothing or other help. The Episcopal Church readings for Ash Wednesday, which are also taken from the Gospel of Matthew, including giving alms to the poor in the list of things that believers should do, along with fasting and praying. The priest at the church I attended when I lived in Washington, DC, once asked us to consider how we would treat those in need if they were people we had to interact with every day. If it would make a difference in our behavior if we considered the homeless person on the street or the beggar in the subway part our neighbors, if we knew them by name. I think this is what the pope is getting at. It is far less easy to ignore someone if you consider them part of your daily life. And the truth, sadly, today is that those in need are all around us. For the first time in 50 years, more than half of students in US public schools live below the poverty line. In Russia, the most vulnerable members of society are being squeezed hardest by the economic crisis. Today’s recipe is simple, and can be easily multiplied. Maybe you have a neighbor who could use some warm vegetables. 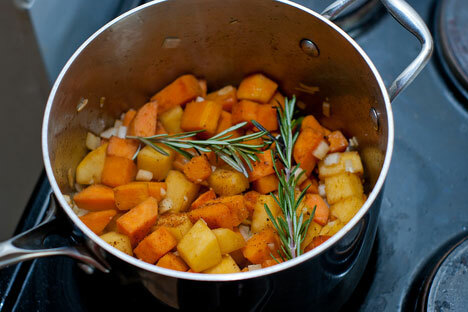 Root vegetables (3-4 carrots, 2 sweet potatoes, 1 large squash, 2-3 turnips) cut into large chunks; 1 1/2 cup shallots or onions, sliced; 1 1/2 cup vegetable broth; 3 Tbsp tomato paste; 1/8 tsp salt; 1/4 tsp black pepper. Place cut root vegetables cut into large chunks in a dutch oven. Try to put them in a single layer. Spread onions over the vegetables. Whisk together remaining ingredients. Bring to a boil over medium heat and simmer until vegetables are tender.